On the whole, the Sunshine Coast has some of the best food and restaurants in Australia, possibly the world. The breadth and scale of the culinary art on offer from the coast to hinterland, and right along our pristine coastline is truly staggering. We’re spoilt for choice. The following, is a list of some of my favourites, but particularly in the Peregian Beach area. The list covers three restaurants that stand out for me as some of the best the coast has to offer – but may escape the notice of most. First and foremost on this list is the fantastic Pitchfork Restaurant. Pitchfork sits at the very heart of the Peregian Beach square – offering a modern Australian cuisine with a seasonally changing menu. It is, of course, fully licensed and offers stylist and rustic feel with its tasty décor. 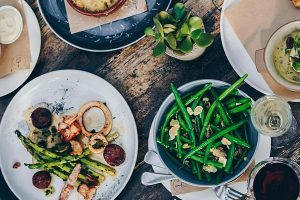 Opened by two locally trained chefs following working around the nation sharpening their skills, Pitchfork offers a stunning menu that complements the area well. 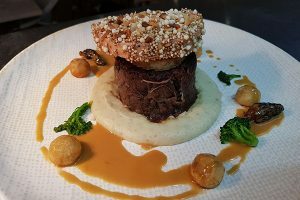 This summer’s menu includes elements and tasteful infusions of different cuisine disciplines featuring highlights such as the Sand Crab Linguine; Confit duck with spiced yoghurt and roast peaches; and the Char grilled eye fillet for the steak-eating purists. When it comes to dessert, Pitchfork is not to be out done. Their dessert menu features a Passionfruit Roulade with Turkish delight ice-cream and Persian fairy floss; a gourmet take on the classic Iced Vovo; and a fantastic assortment of delicious ice-creams and sorbets. For more details take a look at their website. Next on my list is the French Mediterranean experience that is Periwinkle. Sharing the Peregian Beach square with Pitchfork, this restaurant offers a very different culinary experience. 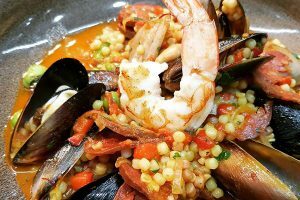 Periwinkle offers a modern French Mediterranean cuisine focusing on delicious seafood and hand crafted sourdoughs, as well as char grilled beef and seasonal, locally sourced vegetables. Their menu offers a rare “French Pizza” that relies heavily on smoked meats, crème Fraiche – with vegetarian options available. These pizzas really are something that must be experienced when so dutifully and faithfully prepared. The main courses are expectedly extravagant, including such dishes as the Moules Frites – a serving of steamed black mussels in a white wine and shallot sauce and pomme allumettes (the true “french fries”). Also on offer is the Seafood Dieppoise – a speciality from Normandy that includes mussels, clams, jumbo prawns and fresh fish cooked in a creamy apple cider based sauce. The dessert menu truly “takes the cake” – offering fresh, Chocolate Profiteroles; Creme Brulee; and Crepe Suzette – a crepe accompanied by vanilla ice cream, orange Grand Marnier sauce and a Chantilly cream. For a full menu and booking details, see their website. 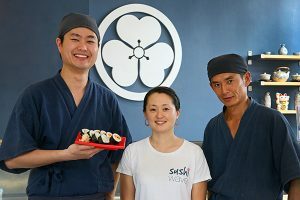 The final entry on my list, and certainly not least, is the fantastic Sushi Wave – a small, authentic Japanese restaurant owned and operated by head chef Kaz Yuki – who opened his doors in Peregian with the goal of offering authentic Sushi which paid homage to the deep traditions of Japan. 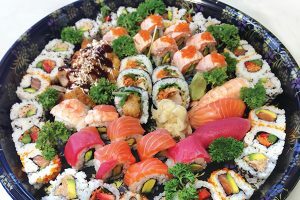 At Sushi Wave, Kaz proudly heads a full Japanese kitchen and dedicated team to dish up the freshest sushi and sashimi as well as mouth-watering salads and Izakaya-style hot dishes. This restaurant is a personal favourite, as good Sushi and Sashimi is hard to find. 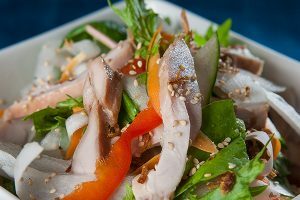 For the squeamish amongst you, not all sushi includes raw seafood – there are plenty of options that include Teriyaki chicken, pork belly, cooked prawn and much more, in addition to the wide selection of authentic Japanese main meals. Personally, I’m a big fan of authentic Japanese food, so Sushi Wave is hard to beat for me as the pick of the restaurants on offer in Peregian Beach. For a full menu and booking details, see their website. 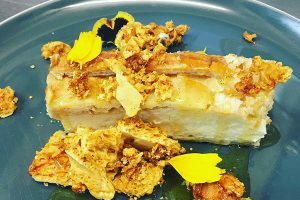 There are of course, many fantastic places to eat within Peregian Beach, and the greater Sunshine Coast – but these are my personal favourites and they are definitely worth checking out.